Please Say Hello To Lucky Cherry! Names, names, names. Everybody needs a name around here! And many of you know I have, um, well, a small backlog problem with getting around to giving them--and then revealing them. And although this is not the promised lady llama's name (it's coming soon, it really is, and I wasn't kidding when I said I had a good excuse for the delay), but this is a new name announcement nonetheless. 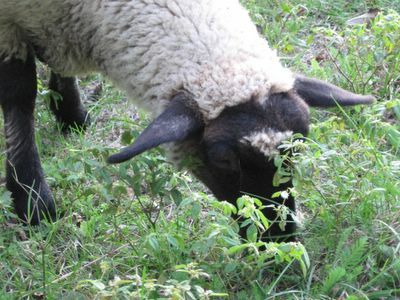 And even though this is only the third of the 2006 ewe lambs to be named (Cary--whose full name is Caraway--and Chocolate Chip Biscotti are the other two), I felt this was the perfect day to introduce you to little Lucky Cherry. Lucky Cherry was named in honor of my new English pal, Cherry, who writes two delightful blogs and maintains a wonderful website/online store. People often tell me they come to Farmgirl Fare to "escape" (which thrills me to no end.) So where do I go to escape the farm without having to actually leave (and when I'm too hungry to devour all my favorite food blogs)? To the English countryside and Cherry's absolutely charming Tales From Pixie Wood. Cherry the person, who spent many years as an actress, was so tickled when I told her about her little woolly namesake, that she sat right down and published a wonderful (and blushingly sweet) post chock full of photos called "I'd Take This Over The Academy Award Every Single Time." Back on my one year Farmgirl Fare anniversary post, I announced that I was taking suggestions for "C" names for the 2006 ewe lambs. So recognition must be given to Dawn and Kat, who both submitted Cherry as a name. They were certainly thinking along the same lines, as Dawn also came up with Cornflake, and (the morning after she put in her vote for Cherry--along with a little French lesson) Kat came back with Chex & Cheerio. Dawn's first choice was Cherry, and her second choice was Cherry Pie, which was also the name offered up by Jas (another English food blogger)--and Lucky Cherry is definitely as sweet as cherry pie. She comes right up to me for hugs and kisses every day. As I mentioned earlier, there are still several more "C" lambs to be named. Click here to read everyone's suggestions so far--and to offer up your own if you'd like to join in the fun. And Happy Friday The 13th to you. I'm hereby declaring it to be a very lucky day! Oh, and if you're more into food than farm animals (yet still happen to be reading this), be sure to stop by Cherry's English Kitchen, where she celebrates home cooking and seasonal recipes in the most deliciously winsome way. Beautiful creature; your animals are wonderful! Hot dog, you sort of chose a name I suggested, but I think it was cheri - (I remember trying to sneak Cluny in as a food name, thence on to fabulous french food) Close enough. Happy 13th to the farm, and you! It is a lucky day-- a writting from you and adorable Cherry!! Thanks for your direction to Cherry Menlove's sites, they are charming. Love seeing another post from you and love Lucky Cherry! I think it's an inspired choice. Now, since you're adding an international flair to the flock, how about "Chimichanga" for another lamb name? I am still checking in to see if you've announced the lady llama's name... so I will be back! Though, I wonder if you are doing this as a ploy to keep us coming back?? LOL have a great day! hello to lucky cherry and thanks for introducing me to a new blog to boot. yep, i still love your pics for a quick farm fantasy. L - O - V - E it when I see a post. Thanks for introducing us to Lucky Cherry. The 13th was pretty lucky for us to, my father in law had by pass surgery and is doing well! I still can't wait to find out the llama's name and the reason for the delay!